"You want to see this thing through? I'm going to have to get… dirty." 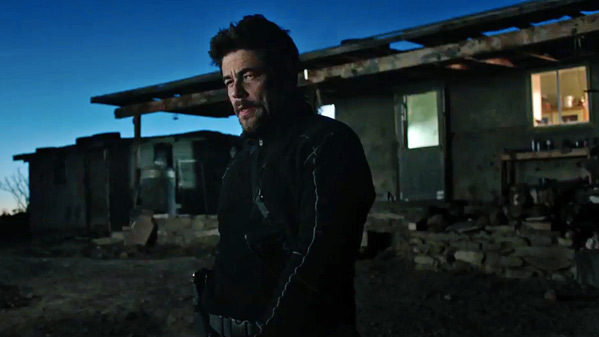 Sony Pictures has unveiled the first teaser trailer for the new thriller Soldado, the sequel to Sicario, Denis Villeneuve's intense thriller set along the US-Mexico border. The title card of this says it's officially titled Sicario 2: Soldado, and not just Soldado, but either works. Emily Blunt is not back this time, as her story is complete, but Josh Brolin and Benicio Del Toro are back. In Soldado, the drug war has escalated as the cartels have shifted to trafficking terrorists across the border. Like pretty much all crime thrillers, this has a masked gunman (referencing Heat) and it looks slick, but I'm not sure it's going to be anywhere near as good as Sicario. I'm also a bit let down there is no lead woman in the cast, aside from Catherine Keener as a CIA boss. Still worth a watch. A follow-up to the 2015 film, Sicario, which centers around the escalating war against drugs along the border of the United States and Mexico. Josh Brolin and Benicio Del Toro are back as C.I.A. agent Matt Graver and his "man on fire" Alejandro. The drug war has escalated as the cartels have shifted to trafficking terrorists across the U.S.-Mexico border, and that's when Matt’s bosses ask him to intervene. Soldado is directed by Italian filmmaker Stefano Sollima, of A.C.A.B., Suburra, and the "Gomorrha" TV series previously. The screenplay is once again written by Taylor Sheridan (of Sicario, Hell or High Water, Wind River). Sony will release Soldado in theaters everywhere starting on June 29th, 2018 next summer.